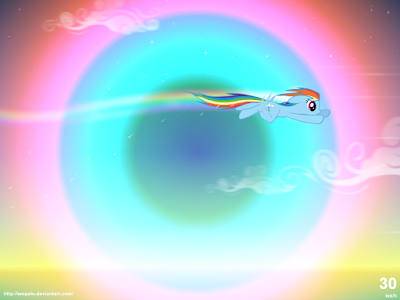 While the site's been somewhat prone to...well, the odd total existence failure now and again, Equestria Gaming has nonetheless somehow managed to be around for quite a long time insofar as the fandom as a whole is concerned. Since it was founded in 2011, we've seen a lot of games and game makers come and go, some of which we've covered and some, sadly enough, we haven't. I personally believe it's more than high time that we rectify that! There's plenty of games, large and small, that we've skipped over the years that deserve a mention, and we're going to start rifling through them here and now ! Admittedly, I don't have any specific posting schedule in mind for these, but honestly, isn't that just part of the fun? Let's go! Now it's time for this week's installment of Playing Games with Horse Nerds™. Usual details ahead! Looks like there's something a tiny bit different in store this week over at CinemaQuestria! Instead of the usual PC game selection, we're headin' on down to console town (oh leave your groans at the door, I liked that) and wrapping this week up with a game of Mario Kart 8 for the Wii U! Man, I seriously wish I didn't work weekends so I could participate in this one. Oh well, I guess! Someone be super cool and win some races for me, mkay? Time: 9:30 pm EDT on Jan. 27th. Just as a reminder before wrapping this up, you need a Wii U if you wanna play along, folks! Ponyage Chronicles, also known as PonyRoom as previously shown here, is holding an open weekend. It is gonna be held from now until around the 29th February. It is a neat 2d MMO like you would imagine a proper action-oriented MMO would be, quests, skills, grinding, the whole lot. It is still in an early alpha stage, actively getting updated and fleshed out. 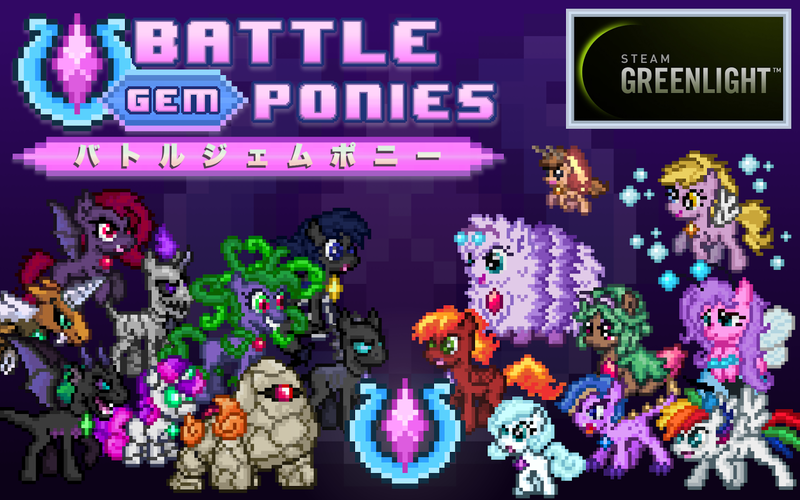 However this weekend we all have a chance to hop in and give this different interpretation of a Pony MMO, so if you are tired of the usual social-focused pony MMOs and MMO-styled games, like Legends of Equestria and Pony Town, come give this a go. Looks like it's Friday night once again, and you know what that means, right? Weekly game stream ahoy! On tap at CinemaQuestria this week for Friday Game Night is the always popular Left 4 Dead 2, which at this point I don't think really needs any introduction, haha! That said, why not wind down from the week by hanging out with your fellow pony fans as the folks at CQ fight through hordes of infected for your entertainment? I mean, that certainly sounds like a fun time to me! As usual, check below for the details! Time: 9:30 pm EDT on Jan. 20th. Normally I'd lament the fact that we've been beaten to the punch on something like this, but I'm honestly fairly happy to be able to talk about this one at all. Spoiler alert: I'm a little overly excited about this one! 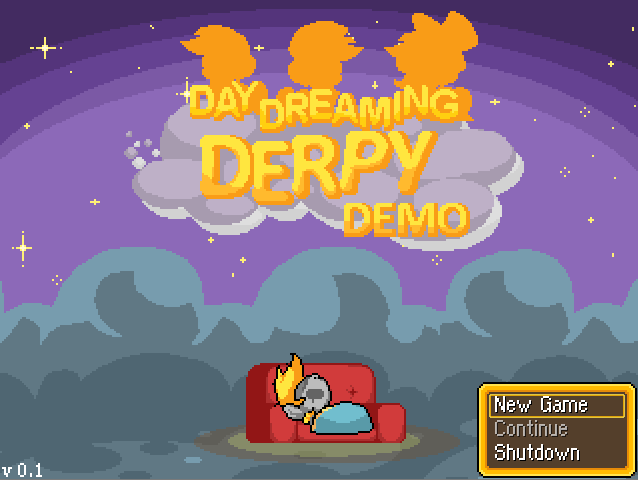 Day Dreaming Derpy, as presented here in early demo-form, is an absolutely wonderful little colorful horse-themed JRPG featuring Derpy Hooves (naturally) having adventures in both the real and dream worlds with plenty of collusion between the two. Costumes, abilities and equippable items earned during the day become usable in the dream world, becoming key in helping Derpy with fighting the nightmares within the ponies' dreams she explores. 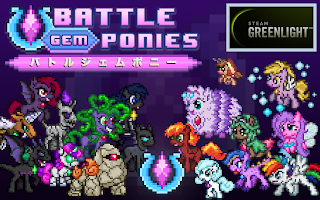 Without going into too much detail and spoiling what should really be experienced just on its own merits, we've got a wonderful little demo here filled with plenty of fan-favorite characters, an interesting story, a delightfully quirky sense of humor and some seriously nifty pixel art that all comes together to make for a super comfy and fun colorful horse gaming experience. Really, even if JPRGs aren't your cup of tea, I believe there's still something to be appreciated about a fangame that's this well put-together, especially at such an early stage. Seriously, the only knocks I can really give it are one or two overworld clipping/collision issues and some basic writing quirks; other than that, it's pretty much smooth sailing! Check out the game's page above for your fill of detailed information, screenshots and dev logs, or you can skip that and jump straight to the download page if you'd prefer. Remember to also pick up and install the RPGMaker VX ACE run time package here to be able to play the game. NOTE: The original Equestria Daily post reports that you may need to disable your antivirus to make sure things unpack correctly. I did not personally experience this issue, but your mileage may vary. Man, these folks certainly work fairly quickly, don't they? Fall of Anterfold, in case you missed the last update post, is a very recent colorful horse co-op survival horror game which has just released its third beta hot off the heels of the previous one. Accordingly, it appears there's quite a few changes in place, with a little of everything from item textures to game mechanics and balance being tweaked this go-around. Check out the developer's website linked above for the changelog and general information on the game, or maybe even give it a go for yourself!